Language is equally important for children's social development as it enables them to negotiate their social world and to control their behavior. For example, as children acquire language, they can ask for what they want, explain how they feel, describe what they have been doing and share thoughts and worries with friends. Children are able to begin to control their behavior by using silent speech to instruct themselves and to plan their actions. Individual differences are seen within the typical profile, with some children having more speech difficulties than others, relative to language comprehension and some children having larger differences between comprehension and production than others, for example. Therefore, each child with Down syndrome should receive an individualised therapy program but the principles for effective practice upon which this should be based is the same for all children with Down syndrome. Teach comprehension and production of early vocabulary with games using objects, pictures and actions to supplement the daily language exposure of the child. 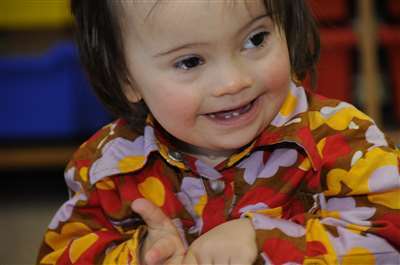 This approach is currently recommended by the Hanen program for children with Down syndrome. [10,11] They recommend targeted teaching and practice of words, then two and three word constructions, as they do not believe that the quality language immersion approach is sufficient for children with Down syndrome. They advise that the words chosen for imitation are chosen with initial consonant sounds that the child can already make, highlighting the need to address speech sound production skills in advance of vocabulary and language progress. Keep a record of words understood and words signed or spoken. DSE picture lotto, illustrating first words with full color photographs. DSE language cards, with color photographs illustrating a selected set of first words. Dodd, B., McCormack, P. & Woodyatt, G. (1994) Evaluation of an intervention program: relation between children's phonology and parent's communicative behavior. American Journal on Mental Retardation. 98 (5) 632-645.